Our journey starts at Halifax, Nova Scotia, Canada and finishes at Reykjavik, Iceland. 1. The English weather can play havoc with your planning – even when you’re about to leave the country. A crossing from Halifax to Iceland – around 2,100 nautical miles – means we’ve all been preparing for freezing temperatures as we get ready to push ourselves outside our comfort zone. We’ve been envisaging encounters with icebergs and polar bears, and as such have all been stocking up on thermal trousers, merino vests, multiple pairs of long-johns, woolly hats galore, super-thick socks, and anything else we’ve thought could keep us warm. What we hadn’t expected was that we’d also need to find space in our grip-bags for flip-flops and shorts. But Gosport, where we all gathered, was officially the hottest part of the country and so we all needed to change our packing list PDQ! 2. Don’t believe what everyone tells you when asked “what size are you”? Everyone on this voyage has undergone training on staying safe at sea. For many of the Crew, the minimum pre-deployment training requirement for our leg – officially designated High Risk and Remote – was an RYA First Aid course and the Sea Survival Course. (Plus, many of the crew have many more qualifications and extensive experience). But even so, as we gathered in Gosport, we were listening attentively to our refresher survival training. And the information certainly seems even more significant when you’re soon boarding a 72ft craft with a steel hull. One of the key takeaways from the Army’s impressive and enthusiastic trainer was that, rather than jumping straight to a life raft if the worst happens, staying in your boat for as long as possible is nearly always the best option. The boat has comms, food, water, is easier to see, and in general is a better bet. Good to know – even though we all very much hope to never have to use the skills we learnt. Over the course of the entire year long exercise 180 serving personnel will take part. That’s a lot of people to bring together. Thankfully it’s often the little things that help to do that. Proudly pulling on our red, emblazoned polo shirts, our group, from across the country, ranging in age from 27 to 59, male, female, Regular and Reservists, all suddenly started to look and feel like a team. We hadn’t realised, but the preparations got this adventure began back in 2016. It’s taken serious work and dedication to organise everything – from flights to food, visas to vaccinations, and much more. For the Crew, it’s almost five weeks away from ours day jobs and loved ones. But all the hard work will soon be worth it, as we set sail on one of the most incredible experiences were ever likely to have the privilege of undertaking. Our crew has only just touched down in Halifax, Nova Scotia, Canada, and already our well-laid plans are under threat – all because of dastardly Chris! Chris is an unpredictable adversary, who is hard to work around and even harder to contain. But, at least, like the well trained Military Intelligence analysts (mainly) we are, we have a chance of assessing Chris’s most likely course of action (and his most dangerous). Because Chris, as you might have guessed, is a tropical storm. And tracking his progress on weather plotters indicates he is likely to soon turn into a hurricane, with winds reaching up to 150kmph. And all the evidence shows Chris is heading right for Halifax! Right into our path as we prepare to learn the ropes, practice our teamwork, hone our leadership skills, and gain our sea-legs in the vicinity of Halifax. A weather alert has been issued for the region with people warned they might have to stay inside – certainly not advised to start sailing for the first time in their lives! We all know no plan survives first contact – but we hadn’t expected our detailed identity to be in jeopardy quite so soon! Looking on the bright side, many of us are pleased that Chris pretty much guarantees that we’ll be in Halifax to watch the all-important football semi-final tomorrow, evening. And then, by the end of the week, Chris is expected to have moved on (to the UK, sorry guys!) so we’ll be on our way! Day 3 (Halifax, Nova Scotia, Canada, 11 Jul 18) [44 36.66N 63 32.83W]‘Sea-Lions on the Shirt’ – England! After waking early, thanks to some lingering jet lag, we were given some introductory safety briefs from the Skipper and Mate, along with a general familiarisation of the vessel which will be our home for the next month. With Hurricane Chris churning up the North Atlantic, off the Nova Scotia coast, we had the opportunity to head into Halifax for some cultural immersion… or watch the football! With innocent optimism, and ‘3 Lions’ on continuous-repeat, we headed into town to a sports-bar crammed with vocal ex-pats. Even the ‘rugby supporting contingent’ were happy to be along for the ride. When the first England goal went in, the bar erupted with joyous chanting. Yours truly was briefly interviewed by a Canadian TV station, there to film the fabled England fans. I was the obvious media choice, selected for my expert punditry and being easiest on the eye (cough, cough). I managed to avoid expletives and express the optimism of the group. Broken hearted we shuffled off to drown our sorrows in mountains of exotically flavoured chicken wings and warm consolations from our Canadian cousins. Early to bed, probably a blessing in disguise, we are all comforted by the future adventures that await. Not for us the despairing office water cooler dissection of yet another year of football heartache; no for us, northern bound to vast icy expanses and bizarre and alien wildlife! Still… it would have been nice to stuff the French! We may have been robbed of our world-cup glory, but life goes on. So it was with sore hearts (and a few sore heads) that we awoke on day four, to a day packed with training and shopping. The morning was spent completing the sorts of odd jobs which keep the yacht running, while the complete sailing novices amongst us were given an intensive set of lessons about using the sails and working the ropes. For the next few hours they could be seen all over the deck practising different knots and muttering to themselves. By mid-morning it was time for the big shop. This had been a couple of days in the planning, as we needed to make sure we bought enough supplies to last for the entire trip. Once at the supermarket we were each handed a separate list and starting raiding the shelves. It became a bit like Supermarket Sweep as we rushed from one aisle to another, grabbing as many items as we could get our hands on. I know I got some funny looks after placing the 20th box of cereal into my trolley. After a lengthy check-out process it was time to load everything onto the yacht. I have no idea how we managed to fit it all in, but needless to say there’s food in every single nook and cranny of the vessel. After lunch it was time to run through the emergency man-overboard drills. For me, it meant my team had to get me dressed into a survival suit with a harness and buoyancy aid, as I was lowered off the side of the boat to pick up our pretend casualty. We’ll be running through the drill over and over again in the coming weeks until it becomes second nature. Once we had finished dunking people off and on the boat, a group of us decided to go for a swim at the local salt water pool, where we saw a few chipmunks. After coming back to the yacht it was time for spaghetti Bolognese and ice creams. Finally with the sun setting over a beautiful Halifax marina, there was enough time to have a couple of beers before we commence the 3 day passage to St Johns, tomorrow. Today was the day we’ve all been waiting for. With a reveille at 0615, the Crew, like England before a World Cup semi, had nerves & excitement in equal measure for our departure from Halifax. Admittedly, our surroundings, the Royal Nova Scotia Yacht Squadron, have been very comfortable for the last few days. As morning winds were light – we set about sail prep whilst alongside, then prepared to slip. With our Marina bill expertly settled by Ships Purser Maj Tony Fyson, and a highly secure spring (eventually) put in place by Blue Watch, with good luck wishes from our German neighbours we were on our way. Whilst there wasn’t much wind – our first navigational challenge wasn’t insignificant. The Canadian Optimist Team – training immediately outside our Marina – had to be avoided before we could make real progress. Avoid them we did, and we left Halifax to practice man-overboard drills, followed by tacking and jibing. Both were uneventful and went to plan, and our designated swimmers successfully completed their rescue drills on each occasion. We sailed on; quietly confident that should that fateful moment come, they will deftly pluck us out of the water with ease. A late lunch of sandwiches and crisps was served, and we made way for St Johns. Unlike the England team, it’s been smooth sailing for the Crew of DISCOVERER today, and a delicious slow cooked chicken curry served by Blue Watch did nothing to harm morale as the watches changed at 2000. Tea and snacks (expertly chosen by IC crisps/snacks O’Nolan) followed, and those awake enjoyed a stunning sunset before moving to night routine. Weather: Sunny with intermittent clouds. Sea state: Something just above millpond. Morale: Good – curiously heightened around meal times. Only one mild seasickness case to date. Today was our first full day at sea, and the Crew are already settling into their routine. Following a crisp but magnificently star-lit night of eastward motoring, dawn broke with the wind still coming from exactly where we wanted to go. Although the sails were ready to hoist, the engine continued to power us steadily towards St John’s, and our rendezvous with the First Mate. Being under engine gave White Watch the chance to practice reefing the mainsail, and everyone a gentle introduction to helming. However, the drills and training were routinely interrupted by cries of “thar she blows”, as the ocean provided us tantalising glimpses of the wildlife below, and some of the variety we hope to encounter as the journey reaches more remote areas. Seals, dolphins, and even the occasional whale, complete with gloriously clichéd lifted tail, all made an appearance during the morning. But the sunshine and steady, languid swell were not to last. By mid-afternoon, the weather had changed to a grey, foggy drizzle, and the crew started donning more and more foul weather kit. Below, cooking became more taxing, as steepening swell caused pitching and rolling, and fun on the gimballed stove. By nightfall, with all on-board fed and wrapped up warm, Red and Blue Watches began their overnight stints. The miles ticked down through the dark, wet hours, bringing us to within 150 NM of Cape Race by breakfast. After leaving Halifax, there was the first opportunity to work as Watches. With all Watches running through the necessary drills to raise and to reef sails. Going through the drills in the rain and the fog definitely helped build team spirit, and was useful to practice for the individual roles which contribute to the getting the boat moving. For the complete Novice the first experience of no engines running and the boat being quietly propelled through the fog was a great feeling, particularly when at the helm. As the boat heads further North, the spotting of wildlife being increasingly regular with a pod of dolphins playing in our bow waves being a highlight leading to many replays of the video during the off Watch period. The Crew is now settling into routine out at sea, the focus on what Mother Watch was cooking and providing became a hot topic of conversation with each Watch adding an extra flair when taking charge in the galley such as fresh bread for starters. All in all, day 7 was summed up succinctly by one of the watch leads with the comment “Things are moving in the right direction…..twice”. As Blue Watch, we took the midnight – 4am shift, getting up in the dark and expecting cold air outside. It was a pleasant surprise to find warm winds when we got on deck. The fog that had followed us from Halifax still hung in the air around the boat. Accompanying the creaks of the boat under sail was the clicks and chatter of dolphins tailing the boat through the darkness. We had followed a roughly straight course from Halifax and halfway through our shift we turned the corner to go further North up the Canadian Coast to Newfoundland. After the shift change, the morning Red Watch on “mother” produced a morale boosting porridge with ginger and apple – upping the breakfast cooking contest another step. Outside, the relentless fog, characteristic of the Grand Banks area we were sailing close to, started to ease. Optimistic it would burn off with the rising sun, we took off waterproofs and put on sunglasses only to have our expectations rained on five minutes later. On the wildlife front, pods of Dolphins and fantastic footage of them were still doing the rounds amongst the crew. An enigmatic sighting of a Whale tail – seen only by a few – kept us looking eagerly out to sea. Today brought a new surprise – on top of the misty seas hundreds of puffins were on the water. The small but dumpy birds were variously paddling, flying and diving out of the way of the boat but it was another first time experience that myself and many of the crew have had on this expedition. At 12.20 we came into St Johns, land suddenly rearing out of the mist on our port side. A welcome break after three days at sea. 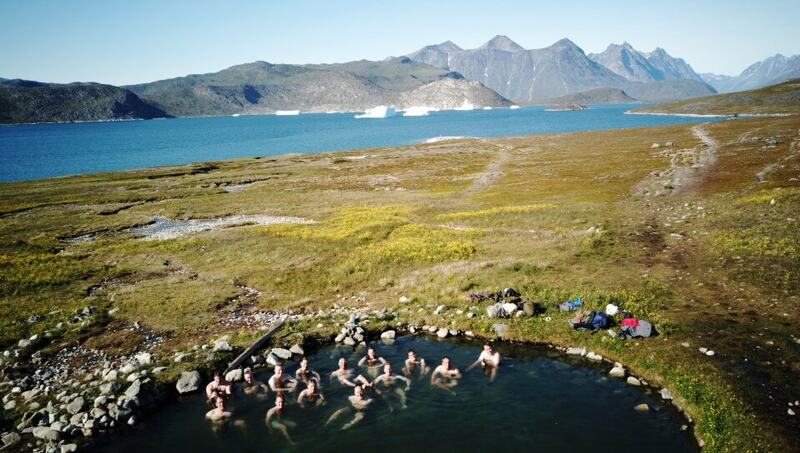 Everyone is looking forward to a day of rest and relaxation before our next much longer passage to Greenland. After three gruelling days at sea, battling thick fog and some cold and wet conditions, the refuge of St. John’s greeted the Crew with open arms. The consistent theme of this town has been overwhelming hospitality. We had all been dreaming of warm showers and food that didn’t slide across a rocking table, but had mixed feelings when the Skipper parked us up right outside a pub restaurant (excellent planning) but with no shower facilities in sight. We were rescued by the friendly staff at a local gym who offered the use of their showers for free! You can imagine the confusion of on-lookers seeing fifteen people walking down the main road with towels and wash bags. Once the boat was put to bed, and with the crew oozing soapy freshness, we all enjoyed a night in town listening to local music where we conducted our own British rock invasion. Bands taking requests were urged to play British pop songs so we could sing along… or shout along in most cases. Such was the popularity of the Crew singing and dancing that a number of locals came to visit us at the boat the next morning. You’ll be surprised to hear that despite the growing fan base, the crew have not been offered any professional entertainment contracts…yet. It’s not all song and dance though as the next day was spent conducting mast checks and boat maintenance to ensure we were ready for the next passage of the leg. An intimidating voyage across almost 1,000nm of the cold Labrador Sea doing our best to spot Orcas and Polar Bears whilst dodging icebergs. The Skipper and Mates have been tracking the ice conditions for the last few days and we have had to change our original passage plan to avoid a dense ice field and make it safely across to Greenland. This will be a challenging passage for the Crew and for most of us is a once-in-a-lifetime opportunity to see this part of the world. We are all eagerly awaiting the adventure which starts early tomorrow morning. An early rise in St Johns, Newfoundland, saw the Crew prepare the yacht for a 900 nautical mile, 7 day voyage across the Labrador Sea, which is infamous for its fog banks. The day has been warm with a bright sun helping to lighten the morning fog. 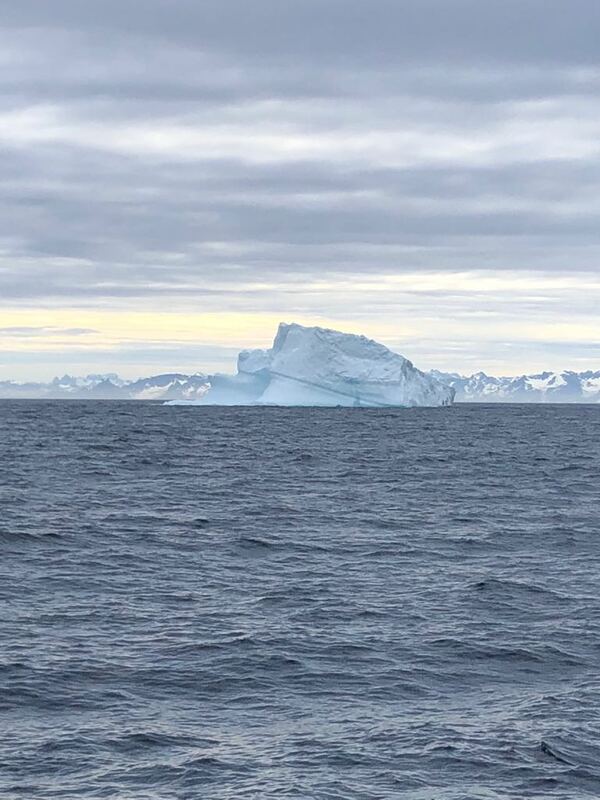 The Puffin and whale population is increasing as we sail North and we sighted our first large ‘non-tabular wedge’ iceberg 5 miles off the Port Bow. The sextants have been out as some members of the Crew have fun with complex maths. The sea has been relatively calm and we have settled back into the Watch system. This age old system has three Watches rotating every 24 hours: one ‘on watch’ four-man team sailing DISCOVERER for 4 hours on deck, whilst the ‘off watch’ team sleeps, eats or rests. They rotate the Watch with the third four-man team being ‘Mother Watch’, which feeds the Crew and maintains the yacht. We are currently in competition to produce the best meals and bake the best bread. The Crew ranges from complete Novices upwards and it’s great to see the differing watches really coming together and the skill levels rising as the sea miles increase as the voyage progresses. At 0100 the wind speed built to around 30 knots, and the decision was made by the Skipper to reduce the size of the main sail by putting in two reefs. The task fell to Blue Watch, who, despite the crashing waves and poor visibility, got the job done with minimum fuss (receiving a rare bit of praise from the Skipper). 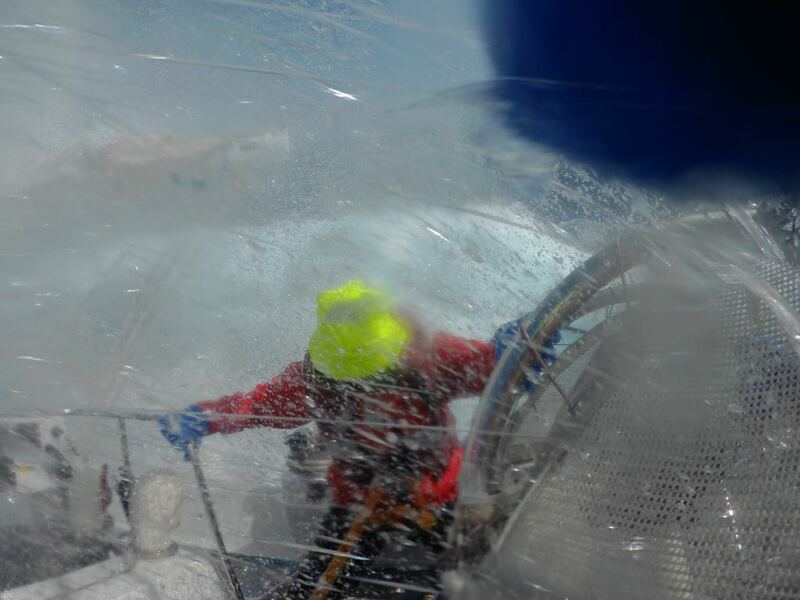 With the right sail up for the conditions, the top speed of the trip so far (of 12.3 knots through the water) was recorded by LCpl Louise Sladen on the helm. As morning came the conditions changed again. The fog and rain returned, and the wind died off. We were left with no choice but to drop the head sail and start the engine. The sea state also began to calm down, which was a nice change from the rolling three meter waves of the night before. Those that couldn’t get any sleep were then able to sneak in a few hours on their off watch. It’s a sailor’s life for us, as we reach the halfway point of our voyage between Canada and Greenland. And it’s also starting to become a sailor’s vocabulary as well, as the Novices start to pick up the proper lingo for the huge array of equipment on-board. Learning the ropes – describes gaining a knowledge of how something works for the first time. This experience has certainly been a steep learning curve, pushing ourselves physically and mentally to pick up new skills as quickly as possible so we can be a valuable member of the Crew. Much of this has literally been about ropes. Learning what they’re called (once on board a boat, a rope is no longer just a rope, it will have a new name depending on its task: a sheet, a halyard, a Cunningham, a kicker, a running back stay, a spring), what they do, where they go, how and when to use them and more. 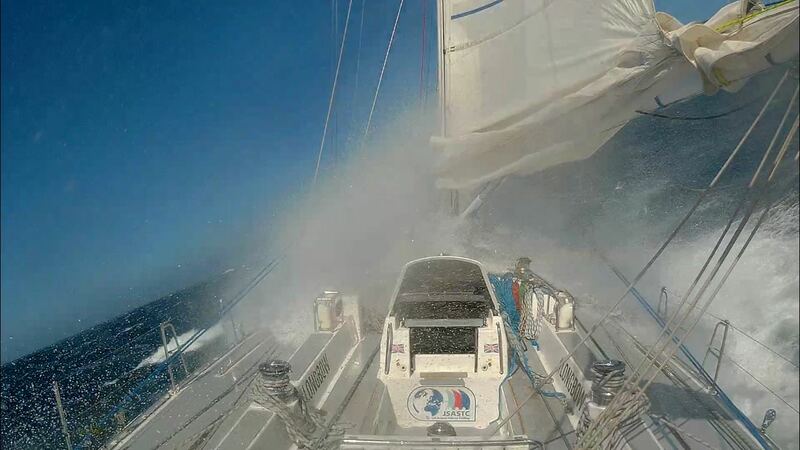 Sailing close to the wind – when someone is pushing their luck and could very soon be in serious trouble. Wind is crucial when sailing, so one of the things we’ve learnt is points of sail: the angle to the wind the boat can be at and how this impacts her course. For example when the wind is right in front of the boat it’s a ‘no-go zone’, where you won’t be able to sail. And when the wind is on the port (left) or starboard (right) of the bow (front) of the boat, it’s at ‘close reach’. At this point you are sailing ‘close to the wind’. This means that you can sail… just. But you are almost in the dead zone where your passage will be quickly stopped. Don’t like the cut of their jib – describes thinking someone isn’t up to the task. The jib is a type of sail flown in front of the mast, and created in a precise way to ensure the right aerodynamics for the boat. Sail-making is a complex task, and the cut of the material (traditionally canvas) can make a big difference. Therefore if we didn’t think much of the cut of the jib, it would mean we’d be sceptical about the sail’s ability to perform as we wanted it to – thankfully not something we need to worry about on the Army’s 72ft yacht HMSTV DISCOVERER. Take the wind out of their sails – describes slowing someone’s momentum down. Each time the wind changes, the boat’s Skipper and Mates intuitively reassess our course, considering any modifications we might need to make. One of these might be to put a reef in, which means reducing the size of the main sail. This is normally done as it gets windier, reducing the momentum of the boat so that it’s easier to steer (and probably slows down) once there is less wind in the sails. We have been sailing North-East for the last four days and have so far covered 610 nautical miles since St Johns. The early hours of the morning were marked by thick mist, caused by the warmer moist air from the South flowing over the cold Labrador Sea. Around dawn, the mist cleared and visibility restored to the full horizon, and our little world previously restricted by the mist grew. Red Watch marvelled at the acrobatics of an Arctic Tern endeavouring to hitch a lift on the VHF aerial atop the mast, as it swung back and forth in the swell. After 15 minutes the Tern gave up and moved on to find another vessel to rest on, but it’ll be a long flight as we haven’t seen any other shipping for over two days now and the closest land over 150 nautical miles away. The Labrador Sea, this far from land, is a remote and wild place. Mid-morning was marked by a visit of a small pod of Pilot Whales, and during the day a succession of changes to the sail plan was prepared to ensure we were not over- canvassed for gales forecast for later tonight and into tomorrow. The rest of the day we have been blessed with bright sunshine and great sailing, but still require multiple layers of thermal clothing and Gore-Tex to keep us warm for the duration of each four hour watch. Liberal sun tan cream was applied to noses and foreheads; the only parts of our skin remaining visible. DISCOVERER is currently pushing onward through 25 knot winds and 2 meter swell, with up to 4 meters and 40 knots forecast. The night will be memorable for all the Novices and many tales of previously experienced storms will be told over a hot brew. A sturdy boat and an equally stalwart Crew are up to the task. If the aim of Army adventure training is to take people out of their comfort zone, then that box was well and truly ticked. The voyage from St John’s had so far been victim of thick fog and limited visibility. The fog eventually cleared and was swiftly replaced with strong winds and growing waves. It wasn’t long before the first reef in the mainsail, quickly followed by a second then the third; I would have suggested a fourth and fifth if that had been an option! By mid-afternoon, the winds had reached 45 knots (Force 9 – Severe Gale) with 4m waves on the beam, having built from an earlier 2m swell. As Red Watch emerged through the hatch to take the helm from Blue, Bex (Rebecca) and Chris Kirkham were welcomed by a crashing wave that discharged both of their life-jackets by the time half of the wave had drained away from the cockpit. Awesome, challenging sailing conditions, with plenty of those below visiting the heads to review their lunch. Happily, as we approached the shelter of the coast, things calmed down to make it all a surreal memory, and we were struck by the beauty of the low sunlight over the mountains to the North and the surrounding ice shards in the water. “WELCOME TO QAQORTOQ”, proclaimed a huge red sign as we took our first on-land steps for almost a week. It’s “the coolest place on earth” added the Greenland tourist logos. It’s hard to disagree with either message. We’ve been really welcomed as we explored this amazing land at the top of the world, and it’s also been an incredibly cool experience (although, rather than cool, it’s actually been really warm, and many of us have been treading the ground in flip-flops – not the footwear we’d thought we’d be stepping out with in Greenland). While some people slept, others went walking in the spectacular landscape; brightly coloured wooden houses adorn lush hillsides, and you never know when you might spot an iceberg! All the while, we were conscious that every time we wandered off the beaten track it could potentially be the first time a human had ever taken that step, such is the remoteness of Greenland. What an incredible thought! The warmest welcome was from Heidi, owner of Café Heidi-mut, a B&B in the town, who hosted all 15 of us in the evening for a delicious meal (washed down with brilliant Danish beer). Heidi, who has lived in the town nearly all her life, ended the night with some Inuit storytelling and song. The tales told of the hardship endured by the locals in the bitter and dark winters, when the only thing which kept hunters going, searching for an elusive seal over the next glacier, was the desperate need to feed their family back in the igloo, and the distant glimmer of hope that spring was on its way. It was a special evening, allowing us to feel like we’d taken a few small steps on the way to understanding this beautiful land. With a storm making its way through southern Greenland we had another day to enjoy the stunning scenery and friendly hospitality of Qaqortoq. After spending yesterday getting our bearings, today most of the Crew were ready with plans of long walks, museum visits and relaxing back at Heidi’s café. The weather started off cooler and overcast, but the strong winds soon blew away the gloom and the afternoon became sunnier, albeit with a cool breeze. While elements of Blue Watch, along with one of the Mates, went to admire the rifles (for use against Polar Bears, etc.) at the local chandlery, Red Watch decided to get an up-close look at the large iceberg, just outside the harbour. We made our way to the edge of town and marvelled at the huge icy block at ground level for a while before deciding to head up the mountain for a better view. After walking out of a valley and climbing up the other side we looked back to find there was only pieces of ice floating in the water where the iceberg had stood moments before. We were devastated! Luckily Rebecca just happened to be watching the iceberg from a different part of town at that exact moment and managed to record the whole dramatic collapse on camera. Other members of the Crew walked around a picturesque lake near the town and managed to fly a drone around the mountains to capture amazing views of the whole area. As the day drew to a close we all gathered round for spaghetti Bolognese on board the yacht before venturing into the small town to watch the sunset at Heidi’s café. Awaking to the visual feast of bright sunshine, Bergey Bits & Growlers at the mouth of the harbour, some in the Crew began to question why so few choose to live in Greenland. Sunshine, stunning scenery, an abundance of water & wildlife, with liver-preserving drinks prices – difficult to see the downside. That said – after two days we had well and truly explored the town of Qaqortoq (including its hotel, pub, and 5 shops) and were ready to leave. An exciting day lay ahead – with a trip to a natural hot spring on a deserted island promised. The excitement was possibly too much for Red Watch though – who started cooking breakfast immediately after reveille – even earlier than had been scheduled! Sails prepared, we left Qaqortoq for Unartoq Fjord at 0830. After a few hours spent hugging the coast, we entered Unartoq Fjord – which can only be described as spectacular. Icebergs evenly distributed around either side of the Fjord, glacial mountains rising away from us inland, and small islands with varying shades of colour, can’t be well described using only words. This author was particularly mesmerised by the rough vs smooth of sea waves pounding then rolling up the side of icebergs – a vision (although not the only one) I’ll take away from this trip that I’ll unlikely see again in my life. The Island of Uunartoq is curious in its beauty. Anchoring to the East, we used our tender to ferry the Crew to the barren beach nearby. Roughly 2 miles in length, with twin peaks to the North & South, and peppered with small pools, boggy areas, and a few abandoned huts – we set about finding the aforementioned thermal pool. Aided by Capt Liddle’s drone, we identified a large pool to the North. Alas – Capt Liddle’s drone did not have a thermal camera in its impressive technology stack, and upon reaching the pool LCpl Savill bravely entered, but it was not the hot pool. A mission to find the hot pool ensued, and we found it immediately to the West of the Island’s centre. A perfect temperature somewhere between “lukewarm bath” and “hot bath” – the natural pool provided immediate relaxation, and the trials of the arduous sailing of previous days seemed far away. 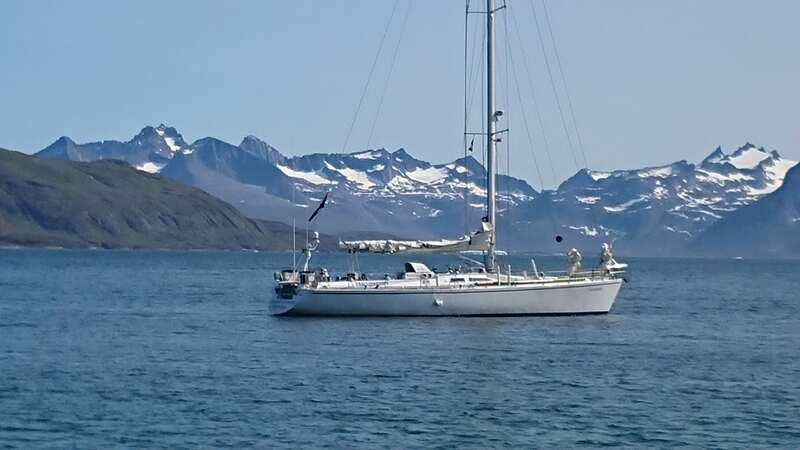 Upon returning to the boat, all the while taking in the icebergs and mountains in every direction, we set off for Nanortalik, an inhabited island 20nm or so to our South. Blue Watch cemented their position as the culinary Kings (and Queen) of the yacht DISCOVERER, with a delicious Chilli Con Carne served at dinner, which this author can claim a small part in. At the time of writing, we are due to arrive in Nanortalik at about 2230hrs local time, where this blog shall continue. We slipped quietly into Nanortalik Harbour at about 2315, the water barely rippling and the still, clear air and bright moon helping us as we came alongside the quay. We woke full of anticipation for the day ahead; this was the day we had discussed most so far – our transit of Prins Christian Sund. This deep-water channel cutting across the southern tip of Greenland looked incredible on the charts, with 3000-4000ft peaks flanking a narrow channel dropping a thousand feet or more beneath the water’s surface; now we would see if it lived up to expectations. It did not leave us wanting. The cliffs rose around us almost immediately as DISCOVERER turned into the entrance of the channel, and then the incredible, savagely beautiful scenery grew higher and extended before us as far as the eye could see. Everyone was on deck, heads turning left and right, cameras burning through batteries at an alarming rate. The rock spires on either side of our progress were dark, foreboding and seemingly endless, with saw tooth ridges patched with snow and scored by millennia of glacial erosion. Despite the incredible depth of water, it wasn’t inky black like a loch as might be expected, but a beautiful turquoise blue, which reflected the rocky peaks and green lower slopes around us. For long periods, the crew were uncharacteristically quiet; breath-taking views living up to their name in full. Even the weather was on our side, with cloudless blue skies and warm sunshine allowing Greenland to show itself off at its absolute finest. And then, as we turned North at Augpilagtoq, the only other splash of colour came into view. Here, in the most barren and brutal landscape, perched on the edge of the water, was a tiny village of typically-Greenlandic, colourfully-painted houses. We felt isolated here; it can only be imagined how the inhabitants of those homes feel most of the year. By late afternoon, we had dropped anchor at the head of a fjord, just past an iceberg, beneath a glacier. 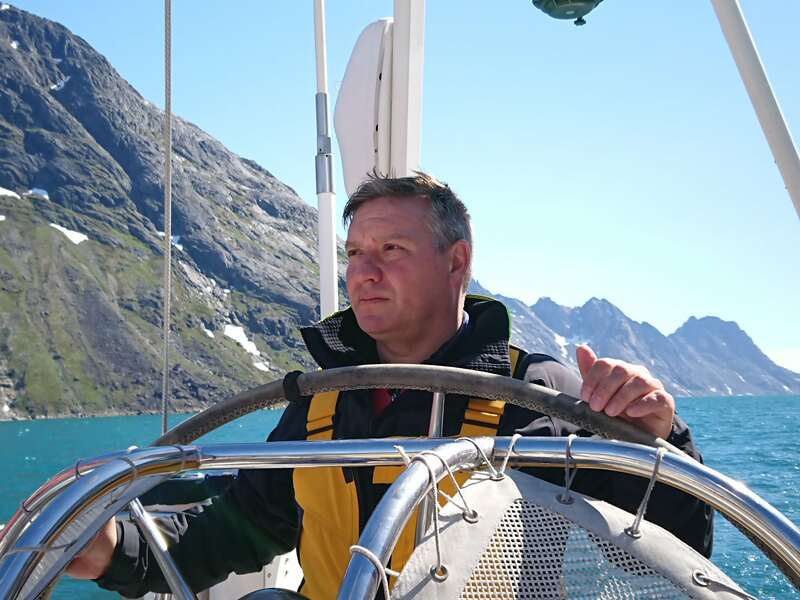 A more remarkable anchorage could not be wished for, and for those novices achieving their RYA Competent Crew qualification, the chance to learn to row a dinghy “out to the iceberg and back” will surely be a good tale to tell in years to come. 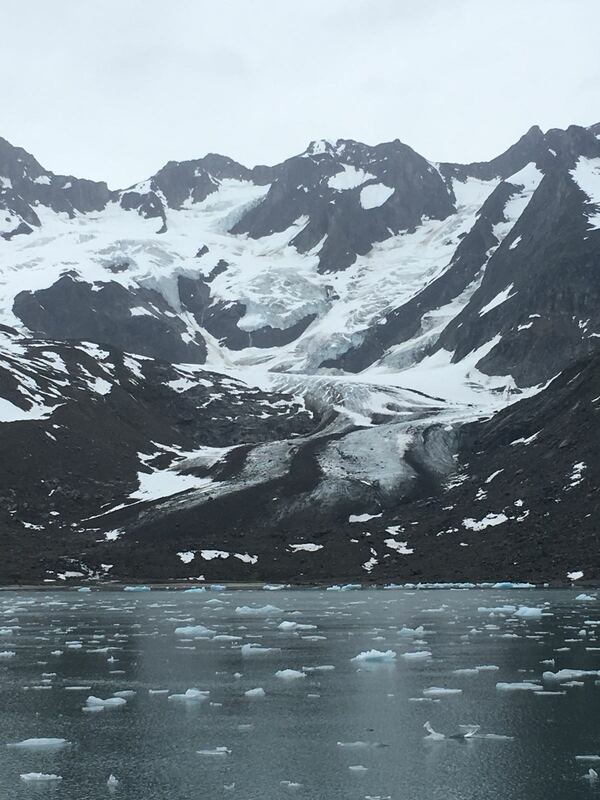 The crew got to stretch their legs ashore, and have a good look at the glacier which extends down from the summit nearly to the shore, before dinner, a celebratory drink for Cpl Sladen’s promotion, and the beginning of Anchor Watch. 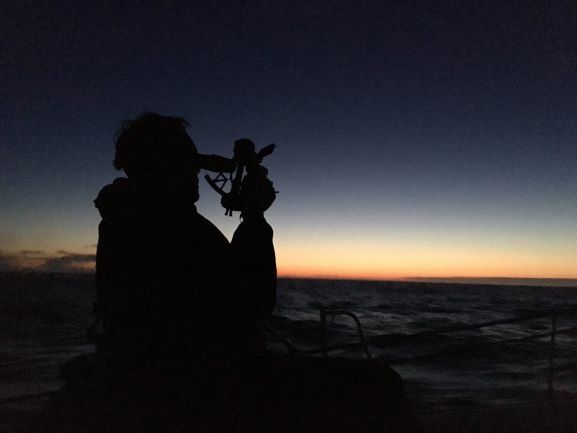 A night at anchor in a small fjord allowed the Crew to practice ‘Anchor Watch’; a task of 15 minutes checks to ensure that DISCOVERER was not drifting whilst the majority of the Crew was asleep. This involved compass bearings of prominent features; such as a bolder as large as a house and a distinctive peak, checks of the anchor chain and the depth sounder. 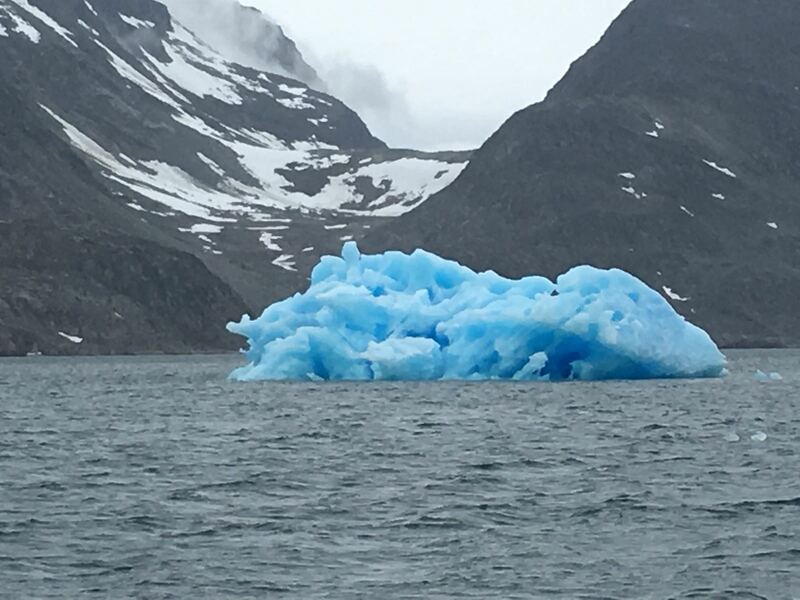 The yacht remained steady all night and whilst a ‘growler’ (an ice block the size of a small car) drifted by, the iceberg, sat at the mouth of the fjord, did not break up. At 0400, Blue Watch lifted anchor and we set off along the second half of Prins Christian Sund. A very cold morning with low cloud failed to dampen our spirits, but did chill our toes somewhat. Our route towards SE Greenland through the fjord was littered with ‘bergy-bits’ (ice the size of a fridge), growlers and icebergs. Glaciers meeting the cold sea water spew ice into the water required the helmsman to pick their course with care. What is hard to describe is the sheer scale of Greenland. Mountains shoot up out of the water, with sheer cliffs reaching over 1500m. The plant life is green and generally stunted, devoid of obvious wildlife, but the landscape has a harsh beauty that is awe inspiring. Before lunchtime, DISCOVERER exited Prins Christian Sund, past the unmanned Danish weather station, and the yacht is heading north-east up the eastern coast of Greenland. Our passage plan forecasts we will be at sea until the early hours of Monday 30 July. Having exited Prins Christian Sund yesterday, the early hours of Saturday 28th July saw the DISCOVERER back on the open ocean. The wind reduced and the sea was almost glassy with no swell in sight. Stealthily a thick ocean fog came in with the night and we found ourselves keeping constant lookout for bergy-bits and growlers. We posted two sentries forward and one Watch member on the Helm. The on shift Mate kept a close eye on the radar. The wind grew bitterly cold and we rotated through our sentry positions every 30 minutes with a member of the Watch going below deck to warm up. The larger icebergs would show up reliably on the radar but smaller pieces had to be spotted and avoided by eye. As the night wore on the fog thickened which led to some close calls. Fortunately daylight started to filter through to us at 3am and the ice field petered out shortly afterwards. As the daylight grew we could see off to our port side a seemly endless line of jagged black mountains – the coast of Greenland looking bleak and beautiful in a coat of snow. We went past a couple of icebergs that were the size of small hills and also saw the breach of whales on the horizon. During the evening, the sea state began to increase and the clouds grew ominously dark. Another gale is beginning to form, and we have already put in our second reef as the wind begins to increase on our bow. We are now seeking to race ahead of this gale, to the safe haven of Ammarsilik, barely taking the time to admire the vast ice-berg factory of Bernstorff Isfjord, which divides Thor’s Land from Odin Land, and spews vast bergs into the current off the coast of East Greenland. Winter has come! The temperature has dropped and ice abounds, huge glacial tongues thrust out into the dark grey sea. Complete wilderness, excluding some long ago abandoned whaler settlements, helps exemplify why Greenland is one of the least populated countries in the world. The small sections of the great Greenland glaciers that we can see give a glimpse of the vastness of this islands ice interior and the unimaginable force capable of carving mountains. As we progress due North, seal and whale sightings become more frequent the sea calms. The approach to Ammarsilik is otherworldly with sheer black snow covered cliffs presiding over mint blue icebergs in a dark and brooding fjord. After docking alongside a large Greenlandic vessel in Ammarsilik we jump ashore in search of a warm shower and cold beer. Alas, Ammarsilik is far from an amenity rich metropolis, despite being the largest town in eastern Greenland. No places to shower can be negotiated and Sunday nights in the town are dry! However, far from disheartened, the scenery is stunning with a rugged beauty unique to the far north and communities which spend long parts of the year in darkness and isolation. Although the sea ice here has receded, not always a guarantee even in high summer, the numerous sled dogs can be seen lazing and howling into the midnight sunlight. As with all our stops so far in Greenland a short stroll through the town elicit hellos and welcomes from the locals, happy to have visitors and clearly proud of the jaw-dropping beauty of the small town they call home. The village of Ammarsilik is nestled between the surrounding glacier carved jagged mountains and the depths of the fjord. We wake to find the cruise ship Black Watch has moored in the deep water a couple of miles out from where we are rafted up against one of the small coastal freighters which supply the smaller coastal hamlets. Relays of small craft bring hundreds of brightly coloured visitors from the cruise ship to shuffle around the church, gift shop and small shop. The population of the village almost double for three or four hours and then the peace returns. We take the opportunity to use the village launderette and bathhouse as facilities and fresh water for washing on-board are limited. This is a hunting and shooting community. 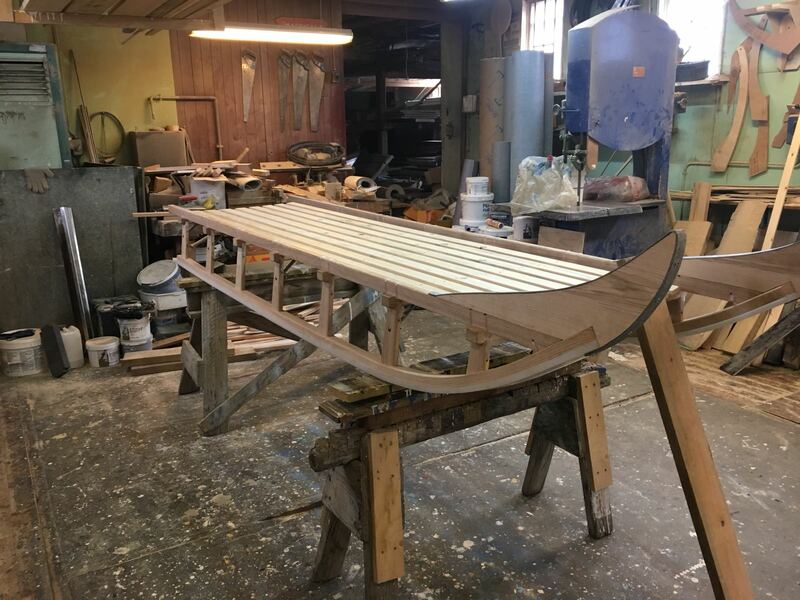 Down in the small port a single carpenter makes dog sleds from timber to the finished product in about a fortnight. The edges of the village are marked by the huskies tethered out who spend the summer digging scrapes to sleep and rest the summer months before their working season begins. 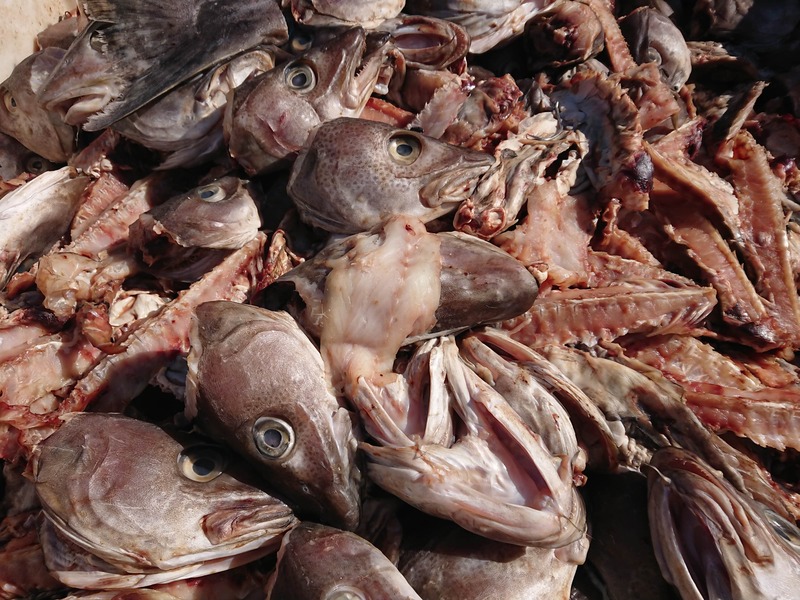 The dogs are fed with seals caught along the coastline their skins left out for the seabirds to pick clean before being tanned locally. Each sled takes between seven and fourteen dogs to pull it depending on the load, distance travelled and skill of the musher the carpenter tells me in Greenlandic, broken English, a form of charades and by drawing pictures on a piece of brown wrapping paper. Tomorrow we head further north towards the Arctic Circle. After a bacon sandwich and picking up supplies from the local supermarket for the onwards journey, DISCOVERER slipped Ammarsilik around 0930. With little to no wind we had to resort to the engine once again. 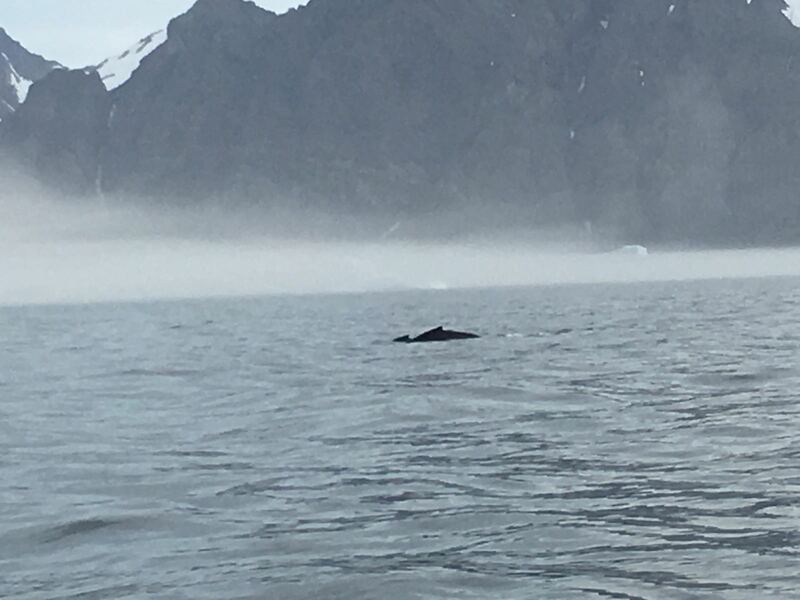 We headed North, though more Fjords with spectacular scenery and various whale sightings along the way. We passed an American World War Two airstrip that was under construction to protect the allied Atlantic convoys from German U Boats. When the Germans surrendered in 1945, the US engineers downed tools and left it incomplete. All that can be seen now is the flattened out strip of land and thousands of rusted oil drums against a back drop of glacial mountains. We had to force our way past numerous growlers and smaller bits of ice in order to get up close to the King Rasmussen Glacier. The glacier came all the way down to meet the sea, where it deposited the massive icebergs we’d been dodging over the last few days. It was an incredible sight that none of the crew are likely to forget. From here we continued our journey North, to the Arctic Circle and tonight’s anchorage in a secluded bay on a deserted Island called Store. The temperature has been dropping all the time and we are now far enough North that it is light throughout the night. But with Lt Col John Bull in charge of the heating today, on board it feels like a sauna down below! In celebratory anticipation of our attempt on the Arctic Circle tomorrow, we broke into the corned-beef reserves, in order to create a marvellous corned beef hash dinner (having received some inspirational corned beef recipe ideas from one of our concerned COs). After an early start today we headed North, to skirt the Arctic-Circle. A promising clear start saw the spotting of 20+ whales and clear skies. Alas it was not to last. A thick fog and cold chill reduced visibility and comfort, making sky-scraper size icebergs we had been seeing over the past 24 hours impossible to spot with the naked eye. The fog only thickened as we punched east across the Denmark Strait toward our next destination of OIafsvik in western Iceland. However, despite the fog and cold it was not all doom and gloom, a steady ray of sunshine shone off the stern in the guise of the Yorkshire flag and accompanying proud and stoic Yorkshireman. As you are probably all aware, today is Yorkshire day, and it shall be celebrated far and wide regardless of conditions. Channelling the spirit of fellow Yorkshireman and explorer Capt James Cook we continue our steady progress. Suffering a barrage of poor Yorkshire accent attempts by the Skipper and Watch Leader Liddle and the crushing realisation that the oven was unequipped to produce Yorkshire Pudding my enthusiasm to celebrate the day remains undimmed. As usual there was some dissent from Lancastrian elements (who, incidentally don’t even know the date of their own allotted date – a quick rush to emulate their superior neighbours). However, for the main the flag stirs our souls flying in front of icebergs and representing Gods own Country in some of the harshest and northern climates that the White Rose on blue will fly this hallowed day. Now on to Iceland and hopes of a decent pint of bitter and some real gravy! The crew of DISCOVERER slipped quickly back in the usual watch routine as we made progress across the Denmark Straits. Those on the early watch replaced the stunning Greenland coast with debates about what type of whales we were increasingly spotting. A photo of a whale identification poster helped confirm the identity a couple of flashes of a tail as Atlantic Humpback whales. The wind was initially inconsistent so sails were often put up and taken down to maximise speed and opportunities to sail. DISCOVERER then settled into a starboard tact (where the wind hits the boat on the starboard/right hand side first) which gave a welcome break for those with portside bunks, as they were pushed deeper into their sleeping bags whilst those on the starboard side remained at risk of falling out. After a tiring 36hrs, Iceland proved a welcome sight throughout the crew with a definite outbreak of moral. This was aided and abetted by the hidden dj talents of a publicity shy crew member (future bookings and dj nickname are currently being negotiated). As the lights of Olafsvik grew brighter, all hands were on deck to ensure a safe arrival. Fenders were put out to protect the side of the boat and crew members leap ashore with mooring lines to secure the boat to the pontoon. Once the boat was put to bed the whole crew tucked into a well-deserved pork curry served on plates not plastic bowls due to the boat finally being level. A post meal fine circle followed which was a chance to humorously air any grievances from the previous few weeks. Misdemeanours (often thought/hoped to have escaped notice), such as salad dodging and being late for watch were highlighted in a “supportive and confidential” manner. As the crew relaxed into the twilight thoughts turned to the prospect of a visit to the hot springs in the morning. A relaxed reveille and a lazy breakfast afforded the Crew the opportunity to catch up on some sleep prior to heading ashore to explore our unfamiliar Icelandic surroundings. Olasvik is the oldest fishing village in Iceland where fishing remains the primary source of revenue and employment. The majority of the Crew where looking forward to a long hot shower so made the short walk in the rain to the local swimming baths which happened to have an outdoor hot tub; rain or not the hot tub was a very welcome start to the Iceland phase of our exped. With nothing planned for the day many of us took refuge from the rain in a local Café; after many coffees and the majority of the World’s problems solved a break in the weather provided the opportunity to stretch our legs and walk around the village and better explore our surroundings. The evening was enjoyed with a Crew meal in a local restaurant, where some were more adventurous than others in sampling the local fayre. Feeling well fed, the Crew returned to the DISCOVERER for the night prior to our early departure to Akranes in the morning. An early start at 0600 for our next move along the Icelandic coast as we move closer to Reykjavik. The Crew is becoming so slick at prepping the boat for sea that we had two watches on deck to slip the lines and raise the sails whilst the other prepped a good breakfast which was then eaten on the move. Our early morning hard work was rewarded with sighting of whales, pilot whales and even a shark whilst at sea. With full sails up and the sun out all Crew came up to enjoy the fantastic conditions and fully defrost our bodies after nearly 4 weeks in the high latitudes. Our arrival at Akranes was as slick as our departure that morning, with all crew members well-drilled in their duties we had sails stowed, warps rigged and lines tied ashore smoothly despite a challenging approach mastered by our First Mate. We may not be regular sailors but we have all become salty sea dogs during the last 4 weeks. On day one, so many of the words of command were alien to the majority of the Crew, now we speak the language of sailing fluently and can feel proud at what we have brought our beloved boat through. Now that we are nearing the end of our expedition, we would like to invite our readers to ask any questions about our voyage or how we conduct some of our sailing drills. We will answer these questions via the blog during our last few days of this trip. Please email your questions to [email protected], we look forward to answering them. Following our weeks at sea, the Crew has been conducting repairs on the yacht and a review of spare parts. One of the foresails (Yankee 3) required some work on one of the piston hanks that secures the sail to the yacht, which Bex executed (as a newly trained ‘Sailmaker’ after some brief training by one of the Mates), whilst Dave was hoisted aloft to the top of the mast to check for cracks. Being 31 metres in the air focuses the mind of the ‘volunteer’ and the person in charge of the safety line. The remainder scrubbed the hull, serviced all the winches, refolded the sails and ate chocolate hob nobs at a phenomenal rate. After cold Artic conditions, Akranes hit a very pleasant, sunny 18 degrees and the team headed for the swimming pool to enjoy the hot pools, steam room and showers. Akranes is very much a working town, with the harbour full of fishing vessels; the tourist highlights being a lighthouse and a folk museum. Tomorrow we head for our final destination of Reykjavik. We were up at 6am ready for our final day at sea. We had breakfast on board while alongside (next to the pontoon) and were on our way by 9am. The weather was blustery and bright, with Force 7 winds expected. We arrived into Reykjavik and waited for the petit French marina supervisor to enable our refuelling. She very kindly booted Sir Robin Knox-Johnston (the first man to sail single-handedly round the world) off our pontoon mooring, much to the consternation of some of the Crew. Amusingly, certain members of our team took such a shine to the Knight that a group of star-struck, giggling schoolchildren would have been put to shame. The rest of the morning and afternoon was spent cleaning the boat including the bilges (under the floor boards) and washing our issued mid-layers and oilies (waterproof outer layers). In the evening after getting the boat ship-shape for the next Leg, we went out into Reykjavik and had a last meal together as a full Crew. Reykjavik is an edgy, busy city with an abundance of little cafes and bars and lots of foot traffic – only one car passed us as we walked down the equivalent of Oxford Street. During the meal four new Competent Crew qualifications were announced, a great result for the Corps. 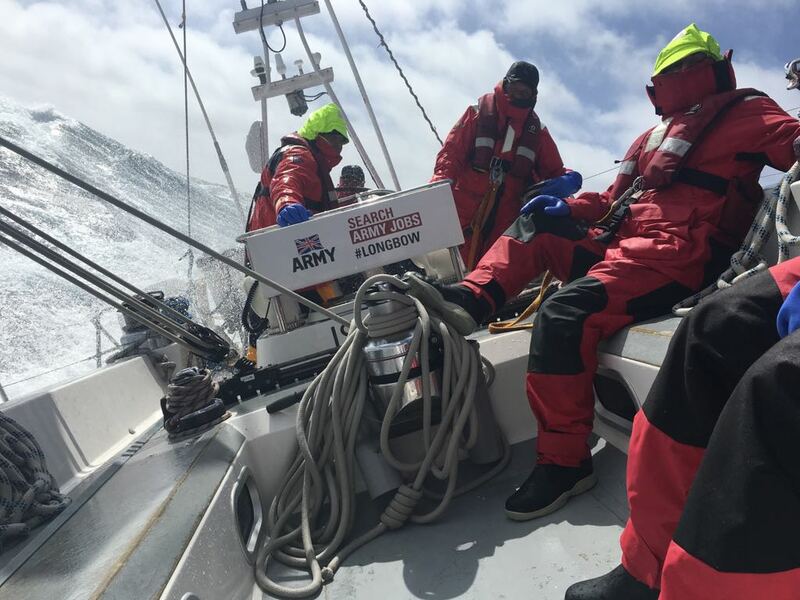 The qualifications were gained by: Cpl Kirkham, LCpl Lefort, LCpl Sladen and LCpl Bodey, in what is probably the most comprehensive Competent Crew course ever (covering approximately 2500 nautical miles during this Arctic Trans-Atlantic crossing). With a full day free for sightseeing in the heart of Iceland’s capital, the crew were excited to get out and explore the many shops and cultural highlights Reykjavik has to offer. One extremely organised sailor (Bex) managed to seemingly visit every museum on offer throughout the city. As well as a maritime museum focusing on Iceland’s fishing heritage, there was also a 360 degree virtual tour of Iceland’s wild landscapes and a tour of the Coast Guard Cutter ODIN, which was involved in the Cod Wars, going head-to-head with the Royal Navy on three separate occasions. After buying lots of souvenirs for loved ones and spending the day learning about Iceland’s heritage, it was time for roast pork and mash cooked to perfection by Steve. Once fed, members of the crew spread out across the city in various bars and pubs in search for the elusive ‘Happy Hour’ which makes drinks prices comparable to London. A few members of the crew ended up in an English style pub with a live guitarist/karaoke set-up. Needless to say the Crew didn’t need a microphone to steal the show! Iceland might have reached the quarter finals of the European Championship, and be a firm fixture in the Eurovision Song Contest, but did you know that parts of the country are actually in a different continent? Well, perhaps I’m using the language a little loosely, and certainly let’s not redraw all of our maps, just yet. But it is true that bits of this stunning island (for example Reykjavik, Olafsvik, and Akranes, where we stayed before) are actually on the North American tectonic plate, while other parts of Iceland (in the East) are on the Eurasian plate. That means that part of the country is the meeting point of two (geological) continents, split by the Mid-Atlantic Rift (Iceland is the only place in the world where this rift is above sea-level). And today we got to walk in this special place – between two worlds – in the beautiful Pingvellir National Park. It’s an area which showcases Nature’s power – for millennia the two tectonic plates have moved apart at around 2.5cm each year, and as the continents have spread apart the whole area has become littered with ravines, ripped open by centuries of earthquakes. Today the landscape was awe-inspiring, sublime and bathed in fabulous light (Geology experts – like my fabulous Aunt & Lou’s Mother – have always raved about this place, and I can see why now we’ve visited: it really rocks!). The park is one of three highlights on the famous Golden Circle route which we visited today. The other two are Gullfoss Waterfall, which roared majestically as around 140 cubic metres of water surged down 32 metres each second. We all got a little drenched from the resulting spray, but after weeks of being battered by sea we were probably more blasé than most of the (huge number of) visitors, and then the Geysir Geothermal Area, home to stunning geysers, shooting vast jets of boiling water up to 40m high. We finished our day at a fabulous thermal pool, with sauna, steam rooms and healing waters. To make the most of the experience we were told we needed to alternate between the warm pools, and the chilling glacial lake, a contrast which shook the body to the core. It was a great day. And a day during which we were all aware that we were in the process of crossing from one world to another, preparing to transition from one lifestyle to another, very very soon. This evening we packed our bags ready to clear the boat that’s been our home for nearly five weeks, and mentally getting ready switch from salty seadogs back to our normal lives, either as soldiers or civilians. Will the experience have changed us? Will our loved ones notice any differences in us once we cross the divide back to reality? I suppose that is a question best answered not by me, but by you, the readers of this blog! We began in true military fashion – with a thorough clean down of the boat from bow to stern. White Watch focused on the outside of the boat, and soon finished. Red Watch inventoried everything on the boat, and cleaned the galley/saloon. It was Blue Watch though, that had the dubious honour of being the “stars of the show” – rolling their sleeves up and cleaning the heads (toilets), forepeak (where our rubbish had been stored during the trip), bilges, engine compartment and gear box! The afternoon was then ours to further explore Reykjavik and complete any last minute shopping/sightseeing before we met for our final the evening meal. For this we chose the Hereford steak house, home of the “Puffin and Whale set menu”. Indeed most of the Crew chose this option, and were rewarded for their culinary bravery. This reporter was particularly taken by the salty, biltong-like consistency of the Puffin starter, and there were clean plates all round after the Whale steak main course too. This was very similar to steak as we know it, albeit with a slightly more gamey quality. All in all a successful final day for each of the Crew, and an early night for most as those traveling back had a very early start Friday morning. After our Great Adventure, and reveille at 0400, a transfer from the yacht to the bus station, and onwards to Keflavik Airport, most of the exhausted Crew slept on board our Easy-Jet flight to Gatwick. Our final goodbyes between the 15 companions, with whom we had spent so much time in such close confines, were interspersed with promises of future contacts and exchanges of opportunities within the CORPS. Finally, the entire Crew of the INT CORPS Leg of Exercise TIGER PACIFIC LONGBOW 2018 would like to thank their Families, Employers & Sponsors (including COs, ICA, ICSA, & The Ullyses Trust) for all of their support, without which this Great Adventure would not have been possible.